Artist's illustration showing the proposed CleanSpace One craft sweeping up a cubesat in Earth orbit. 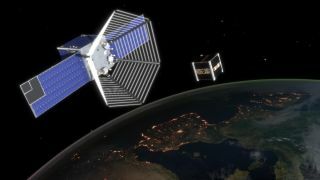 The growing popularity of small satellites as well as the upcoming deployment of low-Earth orbit mega-constellations will likely greatly increase the amount of space junk as well as the frequency of catastrophic collisions, a study led by the United Kingdom's University of Southampton suggests. Tiny satellites such as cubesats have democratized access to space. But for space environment researchers, the technology, praised for its low cost and short timeline from design to launch, is something of a headache. "Seven fragments have been produced in that accident that are now tracked by the surveillance system," Holger Krag, the head of ESA’s Space Debris Office, said yesterday (April 18) during an opening session of the 7th European Conference on Space Debris in Darmstadt, Germany. "One of them generated a conjunction alert with sister spacecraft Sentinel-1B, which is flying in the same orbit but 180 degrees apart," Krag added. The low-Earth orbit (LEO) environment is getting increasingly cluttered, with some 100 to 150 cubesats being deployed each year. Over the next 50 years, the trend might result in a 50 percent increase in the number of collisions far more damaging than that involving Sentinel-1A and a 30 percent increase of space debris objects larger than 4 inches (10 cm), experts have said. "There are two trends that concern us when it comes to space debris," Hugh Lewis, aerospace engineering lecturer from the University of Southampton, said at the conference. "One is the deployment of very large constellations such as OneWeb or SpaceX. The other is the upturn in the number of small satellites being launched into low-Earth orbit." In a study presented at the conference, Lewis and his colleagues modeled what a constellation of 1,000 satellites would do with the current space debris environment, considering multiple variables such as compliance with post-mission disposal requirements, the length of operations and frequency of launches. They also examined the impact of small satellites, considering a launch rate of 270 new spacecraft per year. They found that the unmanaged number of small satellites could wreak greater havoc in the orbital environment than a carefully managed constellation of larger craft. However, the constellation scenario considered in the study was rather modest compared to plans by companies such as OneWeb and SpaceX. OneWeb, which promises to provide high-speed internet access to all the world’s unconnected by the end of the next decade, has recently expanded its plans from 700 to more than 2,000 satellites. SpaceX envisions a similar constellation comprising nearly 4,500 satellites. "If we have a 95 percent success rate with post-mission disposal and the lifetime of these disposal orbits is very short, we only have [26,000] new objects and 40 to 45 catastrophic collisions," Lewis said. "In a situation without the constellation, we would have 37 to 38 catastrophic collisions, so that’s not such a big increase. However, the situation changes quite rapidly if the post-mission disposal success rate decreases." If only 60 percent of the constellation is successfully deorbited, the number of catastrophic collisions would increase to 300 and the number of fragments larger than 4 inches (10 cm) would skyrocket to 100,000. Current international guidelines recommend satellites to be removed from orbit within 25 years. But that isn't fast enough, according to Lewis. "In our model, we could see that that the satellites that are on the decaying orbits of 25 years — they are actually interacting with the background population, and that’s where we see some of those impacts," Lewis said. OneWeb, which expects to start launching its spacecraft next year, promises to deorbit its satellites within five years from the end of their service. Over the past 25 years, the number of tracked space objects larger than 4 inches has increased from 8,000 to 18,000. Only 7 percent of these objects are operational satellites. "That’s about 7,500 tonnes of hardware," Krag said. "In addition to that, there are about 750,000 flying bullets about 1 centimeter in size, such as the one that damaged Sentinel 1A, and some 150 million fragments about 1 millimeter in size." Krag said that each of the 10 LEO satellites operated by ESA has to perform a maneuver to avoid a tracked piece of debris at least once a year. No one saw coming the 0.4-inch fragment that hit Sentinel 1A last year. Controllers learned about the accident only after the spacecraft lost power and altitude.